Real accounts can be opened only after registering a Profile. Even if you have downloaded the terminal at first and want to open a Real account, you will be taken to the Registration page to proceed. If you have already registered, log in to your Profile to proceed. After logging in, go to the "Accounts" from the main menu and choose "Open a new account". A page of opening an account will open. Note that here you can open a Demo account as well. In our example we are opening a Real account in NetTradeX. So, please, choose "Real" in the first field, the platform NetTradeX, account type, leverage and account currency. After ticking the check-box "I acknowledge that I understand and accept the above documents", click on the "Open a new account" button. Your account credentials will appear. Note that when opening your first Real account you need to set a Secret word and save it. Additionally, you will receive your account credentials by email. Make sure to save them. To start trading you need to add your account to NetTradeX terminal. 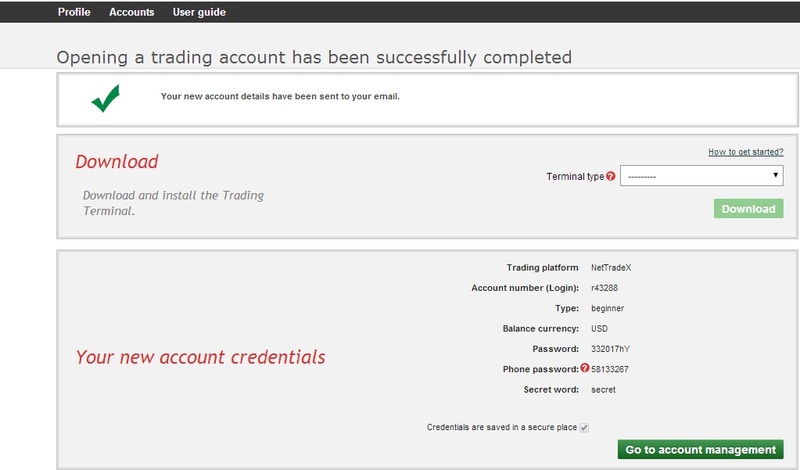 You can see the instruction in the section Adding an account to NetTradeX terminal. For effective trading we recommend you to read our Technical analysis by our analysts which is published in our website regularly.